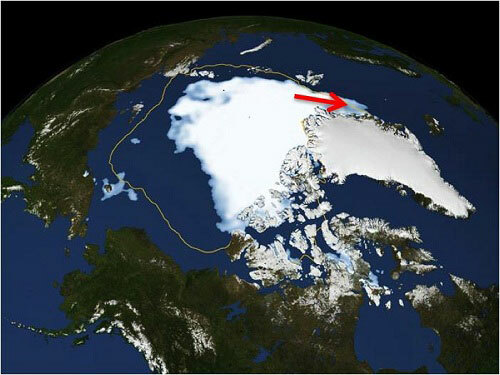 (Nanowerk News) The Arctic sea ice is shrinking, both in extent and thickness. In addition to the manmade contribution to the sea ice loss, there are also natural factors contributing to this loss. A new study ("Arctic sea ice decline and ice export in the CMIP5 historical simulations") from the Bjerknes Centre focuses on one of these factors: the ice export through the large gateway between Greenland and Svalbard – the Fram Strait. This increase in the export contributes to the Arctic sea ice loss, as shown in a recent study (Smedsrud et al., 2008). Our climate models also show that the Arctic is loosing sea ice, but it is not known how they represent the ice export in the Fram Strait. We have therefore investigated the ice export in 6 current climate models that provides 24 different simulations. Perhaps surprisingly, most of these coarse resolution models manage to reproduce a realistic seasonal cycle of the ice export, with more ice floating through the strait during winter than summer. On the other hand, not all simulations show an increase in the ice export from the late 1950s and up to today. Some simulations actually show a decrease in the ice export. Because the simulations do not show similar behaviour, we interpret that changes in the ice export is not governed by external forcing, such as changes in the CO2 concentration or changes in the incoming sunlight. The ice export is rather controlled by internal climate variability within each model, for instance, variability in the wind pattern over the Arctic. The spread in the simulations from one model indicate the extent of the internal climate variability in that model. Because the models show different outcomes for the ice export, it is possible to investigate how the Arctic sea ice responds to an increase or decrease in the export. According to the model with the largest number of simulations (10), we find that a thinning of the Arctic sea ice is associated with an increase in the ice export, whereas a decrease in the ice export is related to a smaller thinning. All simulations underestimate the thinning of the Arctic sea ice compared to observations. This means that the simulations would have been closer to the reality today if they were able to reproduce the increase in the Fram Strait ice export.